GOLDEN ” The primary U.S. lab for renewable energy will receive $110 million in federal stimulus money and another $83 million will go toward wind energy efficiency and other alternative power projects, Energy Secretary Steven Chu said Wednesday. “Wind energy will be one of the most important contributors to meeting President Obama’s target of generating 10 percent of our electricity from renewable sources by 2012,” Chu said. The National Renewable Energy Laboratory in Golden will get $68 million for an energy-efficient office building, $19.2 million for solar, geothermal and fuel cell equipment to produce electricity for its labs and $13.5 million for upgrades to its biorefinery research facility. NREL will get another $10 million for testing and evaluation of wind technology at the Energy Department’s Wind Technology Center in Colorado. The wind energy research money will be administered by DOE’s office in Golden and includes $45 million to research and test drive-train systems for wind turbines, $14 million to encourage private industry development of lighter, more advanced materials for wind turbine components and $24 million to develop up to three partnerships between universities and industry to focus on critical technological improvements for wind energy. Chu, speaking to NREL and DOE employees as the Obama administration marked 100 days in office, said all Cabinet members and top staffers meet frequently to coordinate how to spend the $787 billion appropriated by Congress to boost the recession-mired economy. Obama’s goal, Chu said, is to prepare the country to compete economically decades down the road as well as meet the challenges of climate change and energy demand. Chu said government funding can be a boost for businesses working on new technologies, including more efficient solar cells, capturing and sequestering carbon dioxide from coal plants and large-scale storage of energy from renewable sources. On a tour before his talk, Chu heard from NREL staffers about their work with industry on cutting-edge technology. He talked to scientists producing solar cells on thin flim. 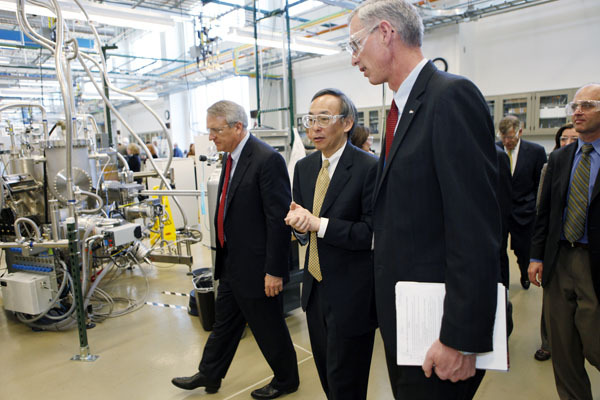 Chu’s visit to the lab was his first as energy secretary. He is a Nobel Prize-winning physicist and former director of the Lawrence Berkeley National Lab in Berkeley, Calif.
Gov. Bill Ritter, who also went on the tour, praised Chu. “It’s your vision that will carry us all, I think, to the next place that we need to go as a country,” Ritter said. 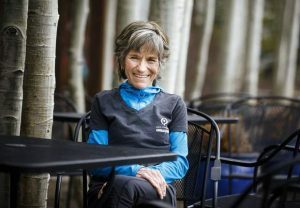 Ritter has promoted what he calls “a new energy economy,” pushing renewable energy as a way to improve the environment and economy. The Energy Department is managing $39 billion in grants, tax breaks and loan guarantees under the stimulus package, with much of it going to renewable energy and conservation programs.